It tends to come as a surprise to a layman to learn that the country in the world with the largest number of Muslims is not anywhere in the Middle East, but is in Southeast Asia instead. This is Indonesia, which is also the largest island country and ranked fourth most populous in the world. The people there have a devotion to Islam the equal of the Arab world, and similarly reinforced by their ethnic traditions. While freedom of religion is guaranteed in their constitution, in practice the majority of Sunni Muslim Indonesians tend to come down hard on those who don’t share their faith; and unfortunately not even an influential position can offer protection from charges against Islam. BBC shows this development in the recently begun trial against Jakarta governor Basuki Tjahaja Purnama, also known as Ahok. Being of Chinese descent and a Christian to boot, he was in a precarious position when protesters took him to court over charges of blasphemy against Islam. They hold that, during his campaign for gubernatorial elections last September, Ahok made a statement criticizing campaigners of his electoral opponents who were lobbying against him by quoting verses from the Koran. To the complainants, his words were construed as speaking ill of the Islamic holy book, and taken even further with their allegations that Ahok was promoting that Muslims should be prohibited from living under a non-Muslim government official. 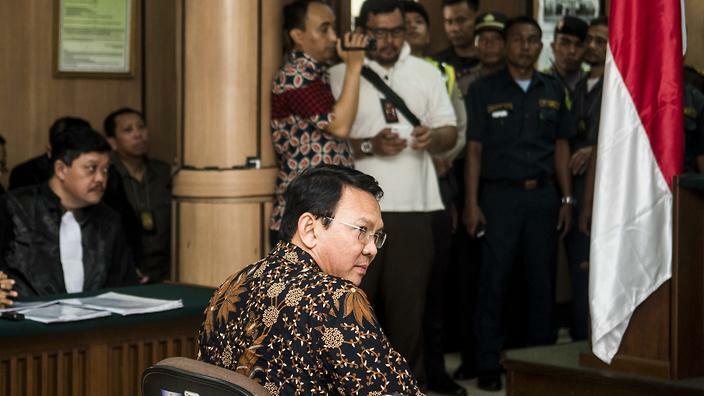 Although Ahok has publicly apologized for his remarks, he denied that his words were tantamount to blasphemy, which then spurred Islamic protesters to have him charged in court. While police named Ahok as a suspect for blasphemy in November 16, up to 100,000 Muslim protesters throughout the country demanded that he be arrested immediately, a gathering that led to violent altercations with police units. On the first day of his trial, the courthouse was packed by opponents and supporters of Ahok, with increased police security around the perimeter as the embattled governor was brought in. During trial, supporting witnesses pointed out that video footage of Ahok criticizing his detractors’ use of the Koran to attack his leadership, which have been circulated online and used to spur the protesters’ ire, were actually edited to make it sound like Ahok was deriding the Koranic verses rather than the lobbyists invoking them. Ahok is the first non-Muslim governor of Jakarta in over 50 years. Originally deputy governor of Jakarta, he replaced then-governor Joko Widodo when Widodo became President in 2014. His predicament now at the hands of Muslims have sparked fear in the region that Indonesia, once regarded as a moderate Islamic country, was becoming increasingly radicalized and a potential flashpoint of extremism in the vein of ISIS in Iraq and Syria.